The Internet of Things (IoT) is the network of physical objects or “things” embedded with electronics, software, sensors, and network connectivity, which enables these objects to collect and exchange data. This has huge applications and implications on Healthcare. Are we prepared for the next big game changer? Every aspect of healthcare has devices from direct care to supporting care and rehab to community care. With the advent of smart mobile phone that space started getting connected and shrinking into the smart phone. Now the smart phones are eating away into the medical devices space. The networks are getting smarter such that the line between IT infrastructure, Networking and Applications is blurring as we move to the cloud. The Digital Hospital has all of these. Whereas Disease management takes this beyond the enterprise into the homes and lives of the person. Insurance and Pharma are analysing the lifestyle data which is not necessarily disease data. Our lives are rapidly getting digitized! On the flip side: Imagine what happens if someone changes the calibration of Lab analyser, Radiology modality, Cath Lab, Dialysis devices, ICU or bedside monitors. Or switches off a pacemaker. Or changes the rate of infusion or gas in the OR. All of this and more can be potentially done remotely in an IoT connected world. Scared already? Welcome to the future. Dr Gupta comes with a rich combination of medical background, IT experience and specialization in General Management from Indian Institute of Management Bangalore. Dr Gupta has done Organization change management, Business transformation, Clinical transformation, Knowledge management and Transition management on globalsourcing model. 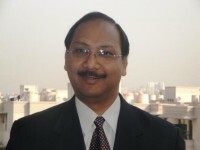 For over 2 decades Dr Gupta has been working in Healthcare Technology business and Healthcare process standardization. This includes experience of starting and leading Healthcare Consulting and eHealth units @ Cerner, FCG/CSC, Perot/Dell, Infosys. Dr Gupta has managed IT and Quality Departments of Hospitals and delivered business transformation by process standardization. Dr Gupta’s experience spans eHealth Consulting, mHealth Consulting, Chronic Disease Management Solution design and HIS/EHR implementation. Due to my background and experience I am interested in Mobile platforms for Healthcare, Digital Hospitals, Pharma R&D Labs, Medical devices and next generation Healthcare Software development and implementation. – Dr Gupta is amongst Top 10 hits on Google search with key words: FCG, Cerner, Perotsystems. – Dr Gupta is the founder of LinkedIn HealthcareIT-EHR-HIS Super Group with > 40K members globally.